This summer has been one of lots of ups and downs. 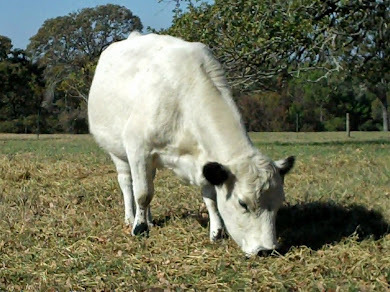 In mid-July our pastures were under attack by huge platoons of Army worms. The grass was pretty and green and tall and just perfect for the coming hot weeks of the heart of summer - and so was a preferred choice for the moth laying critters that leave their Army brats behind. We consolidated most of the herd to the very back pastures and hoped the cows would eat faster than the Army worms back there. Up top, Mike and Mr. Brown, my neighbor, sprayed all the pastures with a watered down Sevin Dust. We tried to keep the potency less than recommended, and it worked, those northward trooping worms gasped their last breath with their mouths full of my pretty grass - and no I didn't feel the least bit sorry for them. I highly doubt even the greenest tree hugger would say the Army worm is a 'sentient' creature. Then in a matter of weeks all that grass we worked to save was drying out and flopping over from lack of rain. So, after two weeks of quarantine in the back pastures, the cows came back to drying grass to munch on. But eventually we did get more rain, about when I started to wonder if I'd have to begin haying the whole of the herd. The grass came back pretty and thick and it looked like I'd have plenty until the fall, even enough to stock pile standing grass through to maybe December. But! The Army worms thought it looked pretty darn good as well. So they came back! About the 20th of September, they hit the thickest lushest grass first and headed northward eating everything in their path. Fortunately, we caught it pretty quick, sprayed again very lightly, and within about two days they quit wiggling and eating my grass. 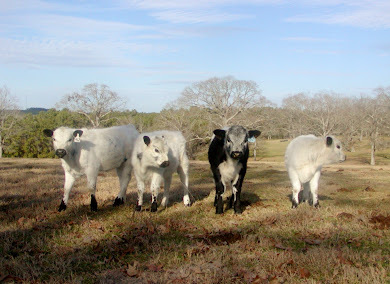 The poor cows though had to be quarantined for 2 weeks yet again in the back pastures -- and they were none too happy about that! 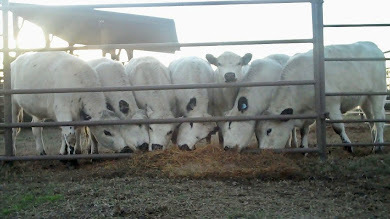 We finally had to start feeding them hay along about the second week, as you couldn't walk in the pastures, much less drive, without the cows running along with you and begging to be let out. We fed some left over last years hay that was in amazingly good shape, so it is always good to have some hay left over for just such an emergency. We fed the hay in the next pasture over, we call it the Sawmill pasture, as once long ago a local sawmill operated on that land. 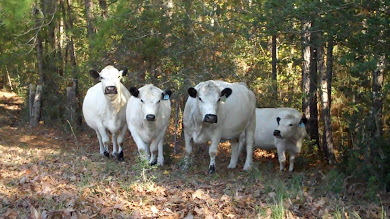 As luck would have it, a first calf heifer decided to head back to the very pastures where they'd all begged to leave from (there was still grass, they were just tired of being back there, they are peculiar that way); anyway, Opaltine, an overmarked heifer out of Black Sapphire and Elvis, headed back to those pastures. For hours that evening we searched for her with zero luck. 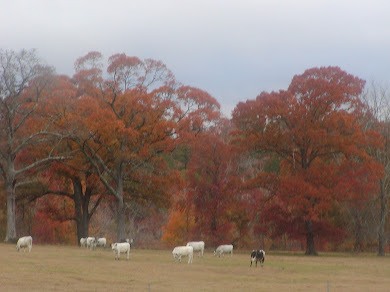 I was comforted by knowing that no buzzards were circling atop the thicket of woods that run through and around these pastures, hoping that meant she was fine wherever she was. The next morning I called all the cows back to the Sawmill pasture (they'd eaten within two days all of 3 very big bales of hay) for freshly replenished hay, and I think Opaltine must have heard my shrill "Hey Girls" calling. Once the rest of the herd was back on their new hay, I went again in search of Opaltine, and there she was coming out of the woods with her little healthy bull calf trotting along beside her. I was so relieved. I followed along behind them until Opaltine hit the woods for a shortcut to the next pasture, she was clearly heading for the Sawmill and the hay. Decided all was well, and came on back to the house. I checked back a couple of times for the new calf, but he wasn't around, but Opaltine was, eating like the Elvis daughter she is, non-stop. 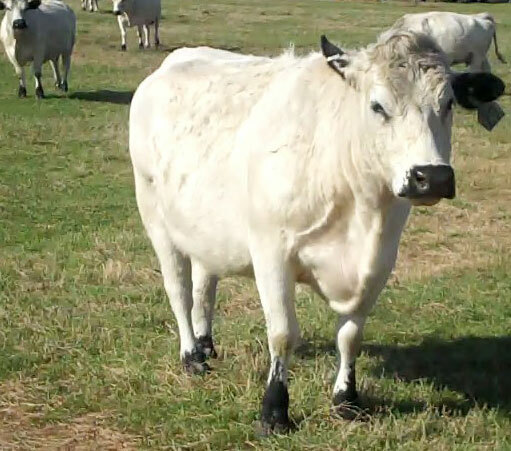 The last time I checked she was lying down fat as a tick and content, but still without her calf. So it was off to the woods to track her path and find her calf, as it was now just over 4 hours since I'd watched them trot off into the woods. I finally found him when he stood up and stretched and started checking out just where in the heck he was and wondering no doubt about where his Mom was. I scooted him along, picked him up some, scooted him along some more, until we made it out of the woods to the clearing in the video below. I had my flip video with me, so thought I'd try to film my handling of him, knowing I'd have to drive him out of there to the next pasture. As a really good example of the gentleness of this breed, you'll see that I pick him up and put him in my lap and drive him on to his dam, while he sits calmly all the while. 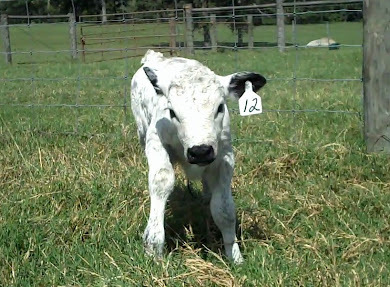 This particular bull calf, while he doesn't look like he's full of great promise, is still a good example of the low birth weights of my Carter bull, as well as the good markings he can throw. This calf is the son of an overmarked female, out of another overmarked female. He measured 24.5, which is about 50 lbs, and having handled him so much, I'd say no more than 50 lbs for sure. 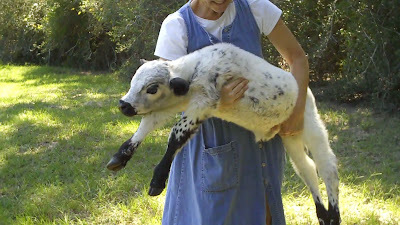 This was actually the second time I'd tried carrying a calf out of the back in my lap while driving my Ranger. It was after the first round of Army worm quarantine, and another calf had been born a few days before it was time to move them back up. In desperation, and pretty much holding my breath with hope, I'd picked that calf up, and it was a good three days old then, and perched her in my lap and we drove across two pastures, her staying quite calm all the while -- and miracle of miracles, she didn't even poop on me! 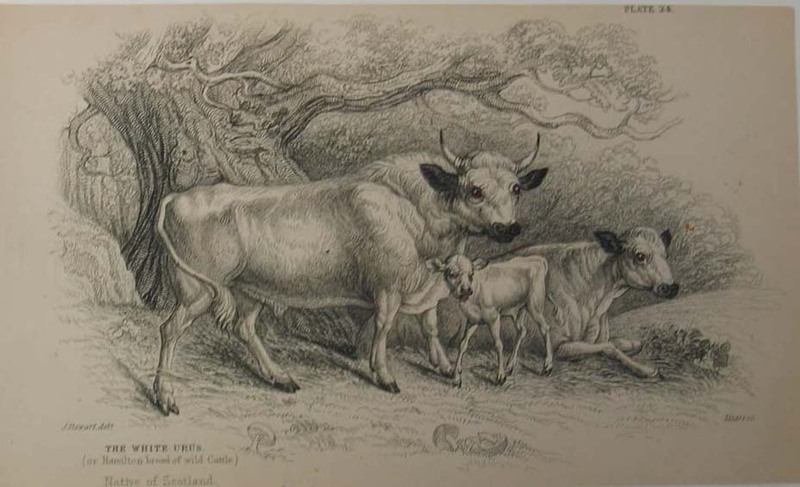 While you might think that perhaps Opaltine is not a good mother, keep in mind she was a first calf heifer, and apparently a hungry one, and no doubt she'd have gone back to where she felt she had snugly and safely left her calf. But, coyotes are so bad here now, and these calves so docile, that it is simply not safe to let them stay in the snug spots their Mom's think they've left them in. As of this past week, I've lost at least 6 grown cats, beautiful calicoes, and one awesome yellow tom - to coyotes. Buzzards have multiplied as well, and I lost one calf this summer the morning it was born by swift attack by buzzards, so we keep a close eye on the newborns.